Top American Fears: Sharks And Zombies Or Corrupt Officials? 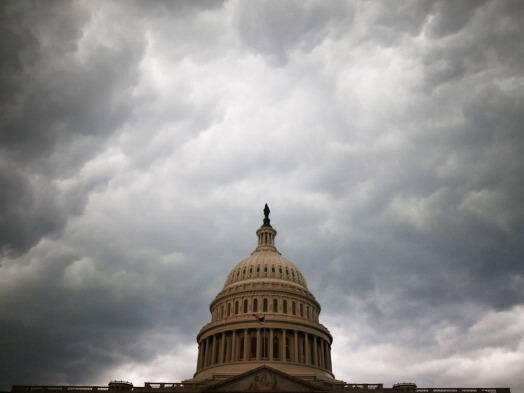 A survey says Americans are by far most afraid of corrupt government officials. It's that time of year. Time for ghosts, goblins and other creatures that go bump in the night. And if those sorts of things give you the heebie-jeebies, maybe you'll take comfort in knowing that 4 percent of Americans say that ghosts (and by that, we mean the "real" kind, not the cute little ones who knock on your door with a plastic pumpkin and a sheet over their head) make them afraid or very afraid. Five percent of us say the same about zombies. Seven percent are freaked out by clowns. Those numbers come to us from the fourth annual Survey of American Fears, conducted by Chapman University. The No. 1 U.S. fear, according to this survey? Corrupt government officials. Nearly three-quarters of Americans say that government corruption makes them afraid or very afraid. That is by far the top concern of those surveyed, and it has shown a nearly 17 percentage point jump from three years ago. Also ranking among this year's top 10 list of U.S. fears? Pollution of oceans, rivers and lakes. Not having enough money for the future. The prospect that the U.S. will be involved in another world war. Scoot further down the list of what keeps us up at night in 2017, and you'll find, in descending order of concern, everything from terrorist attacks and identity theft to public speaking and "technology I don't understand." According to this survey, twice as many of us fear that someone we love will die than we fear dying ourselves. We are, collectively, far more afraid of heights than we are of needles or flying. And we're apparently as fearful of sharks as of computers replacing people in the workforce. Also on equal fear footing: the fear of others talking about you behind your back and the fear of your significant other cheating on you. Make of that what you will. So, what is not included in this survey? The fear of Friday the 13th — that is paraskevidekatriaphobia. We're left to wonder where that would rank. The fear of rain — ombrophobia. And (sorry, Franklin D. Roosevelt) nowhere on the list of America's Top Fears of 2017 can we find phobophobia: the fear of fear itself. It's that time of year - time for ghosts and goblins and other creatures that go bump in the night. And if those sorts of things give you the heebie-jeebies, maybe you'll take comfort in knowing that 4 percent of Americans say that ghosts - and by that, we mean the real kind, not the cute little ones who knock on your door with a plastic pumpkin and a sheet over their head - 4 percent of Americans say that ghosts make them afraid or very afraid. Five percent of us say the same about zombies. Seven percent are freaked out by clowns. Those numbers come to us from the fourth annual Survey of American Fears, conducted by Chapman University. The No. 1 U.S. fear according to this survey? Corrupt government officials. Nearly three quarters of Americans say that government corruption makes them afraid or very afraid. That's by far the top concern of those surveyed, and it's shown a nearly 17 percentage-point jump from three years ago. Also ranking among this year's top 10 list of U.S. fears - here we go - Trumpcare; pollution of oceans, rivers and lakes; not having enough money for the future, the prospect that the U.S. will be involved in another world war; and climate change. Scoot further down the list of what keeps us up at night in 2017, and you'll find, in descending order of concern, everything from terrorist attacks and identity theft to public speaking and technology I don't understand. According to this survey, twice as many of us fear that someone we love will die than we fear dying ourselves. We are collectively far more afraid of heights than we are of needles or flying, and we're apparently equally fearful of sharks and of computers replacing people in the workforce. Also on equal fear footing, the fear of others talking about you behind your back and the fear of your significant other cheating on you. Make of that what you will. So what's not included in this survey? Well, the fear of Friday the 13 - that's paraskevidekatriaphobia. We're left to wonder where that would rank. Also not on the list - the fear of rain, ombrophobia; pogonophobia, the fear of beards; my personal fear, the fear of forgetting to set my alarm so I can wake up to host WEEKEND EDITION; and - sorry, Franklin D. Roosevelt - nowhere on the list of America's top fears of 2017 can we find phobophobia, the fear of fear itself. (SOUNDBITE OF MELODIUM'S "SATURDAY MORNING") Transcript provided by NPR, Copyright NPR.